This CellML version of the model runs in PCEnv to recreate the results in the published paper. The model has also been checked in COR and the units are consistent. This particular version of the model has alpha set to 0.5 and therefore it represents wound healing in a healthy individual (figure 2, left hand column). Wounds in diabetic patients can take much longer to heal than they would in a healthy individual; some taking up to 18 months to heal properly. This suggests the normal wound healing process is disrupted in some way in diabetic patients, but despite intensive research, the mechanisms underlying this process are still relatively poorly understood. However, by piecing together the information which has been obtained, it is possible to develop a simple mathematical model of the wound healing process and how it is influenced by diabetes. The first stage of the wound healing process is inflammation, and macrophages are some of the first cells to be recruited to the site of injury. They are derived from monocytes and they differentiate into one of three types depending on the chemical stimulus they receive, namely; cytocidal (or killer), inflammatory, and repair macrophages. Killer macrophages remove bacteria and other debris from the wound site by phagocytosis, inflammatory macrophages secrete cytokines and chemokines to attract fibroblasts and endothelial cells to the wound and encourage their proliferation, while repair macrophages help to remodel the extracellular matrix of the wound. The ratio of inflammatory to repair macrophages seems to be a key determinant of the rate of wound healing. In diabetic patients cell proliferation is often impaired, endothelial cells are more likely to undergo apoptosis, blood glucose levels are elevated, blood vessel growth is impaired, and there can be decreased collagen deposition at the wound site. Macrophage removal to the lymph nodes may also be impaired, which might explain the presence of macrophages at the wound site long after the inflammatory stage when they would have normally been cleared in a healthy individual. To date, mathematical models of wound healing have tended to focus on the cell proliferation and repair stages of the wound process. However, in diabetic patients it seems the inflammatory phase should be modelled instead. In the paper described here, Helen Waugh and Jonathan Sherratt address this issue by developing a basic mathematical model of the inflammatory stage of the wound healing process, in particular focusing on the behaviour of the macrophage populations. 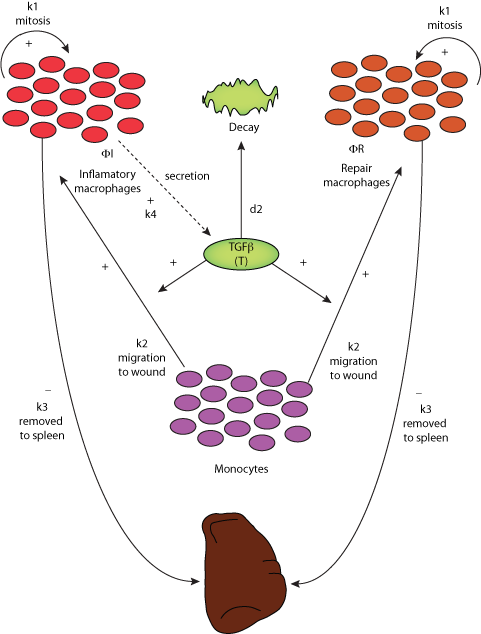 This model is discussed in the context of the available biological data, and simulations are also used to suggest potential treatment strategies. Schematic diagram of the Waugh-Sherratt model of macrophage dynamics in diabetic wound healing. Derived from workspace Waugh, Sherratt, 2006 at changeset c24f5882d550.